On the Saturday before Christmas, I played a tournament at Venetian. They were having their New Years Extravaganza, and that weekend they were featuring a two-starting flight $340 buy-in with a $100K guarantee. The levels were 40-minutes and the starting stack was 25K so it was a pretty good value. The Saturday I played was the second starting flight and those who made it thru either day 1 would return on Sunday. Sadly, I wasn't one of those returning on Sunday. I was at a really tough table, with some solid players. Worse, I was quite card dead. The guy on my immediate right was a dealer. He looked familiar to me but he said he doesn't deal in Vegas, he deals in circuit events at Choctaw and places like that. Despite the fact that he was a dealer, he was a really good player. A couple of spots to his right there was a guy the dealer recognized as a Twitch streamer. You know, one of those guys who would play online and stream it and discuss what he was doing and why. That guy said he had closed down his channel a few years back but apparently he was real popular at the time. This guy claims to play mostly live cash nowadays—5/10 and higher—and it's like "printing money." Which doesn't explain what he was doing in this tournament, but I digress. The dealer ordered lunch while he was playing. When the waitress brought his food, he was in the middle of the hand. Which reminds me. The surest thing in Vegas is that the cocktail waitress will come over to the person whose turn it is to act and ask for his order (or give him his drink), slowing down the game. Anyway, the guy had the waitress wait until the hand finished before settling up, and then he said to her, "Sorry, sweetie." Wow, can a man say that to a female service person these days? Anyway, he ate and then left the table. He was gone for a long time. He missed one or two complete orbits. I hope that's not a reflection on the meal he had just consumed! It was costly because by this time the big blind ante had kicked in and he missed two of them. When he finally came back, the cart with his finished meal was still there, as was his cup of lemonade. So as he was settling back into his chair, he surveyed the cart, reached for his lemonade and then said to me, completely out of the blue, "Did you spit in my drink?" Totally caught off guard by this question, I none-the-less managed to get off a pretty good response (if I do say so myself). "No.…did you want me to?" He looked at me for a few seconds, sized me up, shrugged, and said, "It'd probably be ok."
The tournament drew a big crowd. I was actually surprised there were so many players considering the time of year it was. I think this flight ended up with around 360 runners. For much of the afternoon every table in the room was in use, and the cash games had long waiting lists as they needed so many tables for the tournament. Finally towards the end of my run, I saw that when they were breaking tournament tables they were immediately turning those tables into cash games. I think the flight the day before had well over 250 players. But as I said, tough table and even tougher cards. I won't do a complete hand history. In fact, I'm only going to discuss my last hand, because it was somewhat noteworthy. It's level 7 where the blinds are 300/600, with a $600 big blind ante. My stack was at a bit more than 18K when the level started and I hadn't won (or played) a hand this level. I was on the button with 5-4 offsuit. Easy fold, right? Well, a couple of people and limped in and no one raised. That was unusual because there was usually a raise in front of me every time. The blinds behind me hadn't been aggressive. The aggressive guys all limped or folded already. I wasn't in fold-or-shove mode yet, but I needed to take some risks to get some chips. With that limper money in there, I thought maybe it was worth $600 to see a flop. Maybe I'd get lucky. Another possibility was to raise and try to steal it all preflop, I know. But I thought I didn't have enough chips to risk raising enough to make the steal likely successful, and if I got four-bet I'd be screwed. And if I got called, I'd likely to have to c-bet fairly large with nothing. It seemed like the better option was to call, hope for a great flop, and if I missed, well, I wouldn't be out a lot of chips. So I decided to take a shot and call. The blinds didn't raise. And I got my lucky flop. Boy, did I ever. It was Ace-2-3. Also known as the stone cold nuts. As I'm thinking how to play it, an early position player shoved his short stack. I had him covered. But the next guy also shoved. And he had me covered. So there was no decision to make, I had no choice but to call/shove. With the best possible hand. The rest of the players folded and we showed our hands. The short stack had Ace-9 or Ace-8, something like that. The bigger stack had a set of 3's. So I really needed the board not to pair. I started thinking, "don't pair the board, don't pair the board," repeatedly in my mind. But the turn card didn't just pair the board—it was the case 3. Yeah the big stack turned quads and I was drawing dead. Flopping the wheel just wasn't good enough. At least I lost to quads, right? And thus my tournament was over, just like that. And that's how I learned you should never play 5-4. Serves me right. I wandered over to the food court, in a slight daze, with my drink and tried to figure out my next move. While I was thinking, I caught up a little bit on Twitter. I hadn't been on there all day. I noticed that my Twitter pal Luke Johnston was playing over at the Mirage, which of course is right across the Strip from the Venetian. Hmmm…despite our multitude of Twitter interactions over the past few years, I'd never actually meant Luke. And I started to think that this would be the perfect time to correct this. If you don't follow Luke on Twitter, he is a Vegas grinder (both online and live), a sometime poker dealer, and a total political junkie. He's somewhat of a poker insider and often gives me heads up about poker happenings in Vegas (and sometimes, I'm the one giving him the dope). So I walked over there. I figured I'd recognize him from his twitter pic and surprise him. But when I got there, I was greeted by Kristi, aka Alaskagal. So I asked her if Luke was still there. She said no, he had just left, in fact she was surprised I hadn't seen him when I came in. Damn. I said I came over to finally meet him and she was surprised we had never met. Kristi assumed that everyone in poker knows everyone else—a natural assumption to make. She volunteered to text him and see if he'd come back to say hi—she was sure he hadn't even had time to make it to the parking lot, that's how recently he'd left. Well Luke responded to her text and said he'd come back to meet me. Cool. A few minutes later there he was. 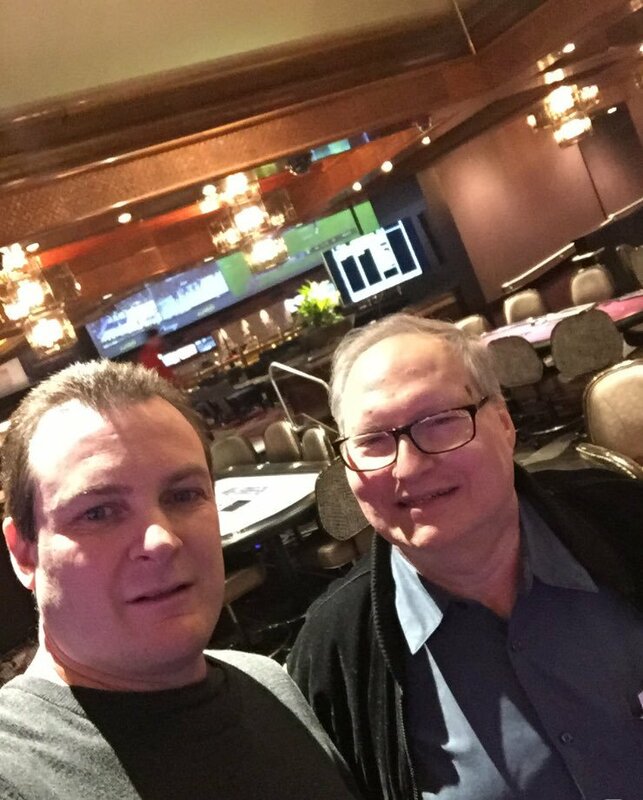 We chatted mostly about inside Vegas poker stuff, who's in, who's on the way out, stuff like that. We did not discuss politics. That's because like me, Luke doesn't believe in discussing politics in the poker room. When he's dealing he won't allow it. Now if you read Luke's tweets you will see he has some extremely strong opinions about the current political scene. He is not afraid to tweet them out in a sometimes pugnacious style. He's certainly not shy about making his case. But somehow I knew that he wouldn't come across that way in person. In fact, he is a really cool, very soft-spoken guy. It was great finally meeting him. Anyway, Luke had to run, so he took off, as did I. I'll fill you in on the rest of my day sometime in the future. Saturday I was back in Ventura for a another 2/3 session. It turned out to be a good session—I won some money, won a hand with pocket Kings and even got a weird story out of those Kings. Early on, probably the first time I was the big blind, I got pocket Aces. There was a raise to $10 and a call, so when it got to me, I made it $40. The original raiser folded, but the guy who called the $10 went all-in. Cool. When I had just gotten to the table, this guy had shoved a small stack preflop, and was called by two players. It turned out he won that hand. Not sure if he had done anything since, but I really didn't care that much about his stack, I wasn't going to do anything but call. Although I could tell my initial $300 buy-in (more-or-less what I still had) easily covered him. I didn't even bother to ask for a count, I didn't Hollywood it up by pretending to think about, I announced "call" as soon as I heard him say "all-in." A player near me said, "That was fast." We didn't show. I really didn't notice the board. I didn't improve. Did I need to? I guess not. It was clear he wanted me to show first but I knew it was on him to show so I waited him out. He then showed pocket 3's. Just like me, he didn't hit his set. It was nice pot to claim so early in the session. When I finished stacking my chips, I had about $425 there. I also found it rather interesting that the guy would shove a ~$120 stack against a three-bet. When I showed my Aces, the same player said, "So that's why you called so fast." I said, "Well, I'm a bad player but even I couldn't have screwed that one up." I open-raised Queen-Jack in late position, got one call, and took it down with a c-bet on a low flop. Then I got pocket Jacks and there were a bunch of limpers. I made it $22 and didn't get a call. I went a long time without getting anything to play. It was a pretty good table, too. There were no total lunatics there, but a few players were keeping the action going. Nothing too crazy. A few calling stations. But I was having trouble finding a hand to play. So I had a really tight image when this next hand occurred and I think that's why it played out as it did. I had pocket 5's. A guy raised to $15. He was one of the more active players in the game. He wasn't playing all that many hands, but when he did play one he played it aggressively. He had me covered and since I still had over $300 it was definitely worth a call, even though we'd be heads up. If he caught something, he'd definitely put some chips in play, at least that was my thinking. Well, I did hit my set. It was like 8-5-3. There were two hearts and one diamond. To my surprise, he checked. So I felt I had to bet, especially with the two hearts out there. I made it $20 and he took just a few seconds to fold. He showed his cards: Ace-King of diamonds. I said, "You didn't want to chase the back-door flush draw?" He scoffed. I really was shocked that he didn't c-bet that flop. I would have expected him to c-bet most flops. I didn't think too much of it at the time, but later I realized it was probably because he saw me as such a tight player. I bet he would have c-bet heads up against any other player. Oh well, he wasn't crazy, and he wouldn't have put a lot of chips in play with Ace-high no matter what. I was getting ready to call it a day. I had still had about $360-$370 in front of me. One last orbit. And of course, in early position, I looked down at the dreaded pocket Kings. I opened to $15 and got four callers. So I guess my image couldn't have been all that tight after all. The flop was Jack-9-2, rainbow. Pretty good flop for my Kings. It checked to me and I bet $55. The guy on my left folded instantly. It looked like the next two players were going to fold as well. Next to him was a woman who had been at the table since I'd gotten there. She had about $500 in front of her. I'd played with her before. She wasn't particularly aggressive but she could get sticky with a hand. Didn't quite play any two cards but she had a pretty wide range. It looked like she started to fold but then hesitated, looked at her cards, stared at the board a bit, looked at her hand again, and just stopped. Hmm… she obviously didn't have me beat but she likely had a draw. If it was an open-ender she likely would have snap-called so it must have been a gut-shot. Or who knows what? Then she started counting and stacking chips. All of a sudden it looked like maybe she was going to raise? Hmm. Then she had the chips out and just froze again. At one point she apologized for taking so much time, but she didn't ask for more time. Meanwhile, the player next to act after her had read her initial intention as I had and I could tell he was ready to fold. Finally she pushed her cards forward. The next two players folded instantly and the dealer started to push me the pot. But the fellow between the lady and me spoke up. "She called, didn't she?" The dealer was surprised but he held down her cards and kept them from the muck. I'm not sure exactly what he said, but while he didn't agree that she had called, he was protecting her hand and questioned the guy, something like, "you think that's a call?" or maybe he said, "that wasn't a call," or something. I said nothing but the guy protesting went on. "I did the same thing just the other day and it was a call. She pushed her chips forward. Isn't that a call?" At this point I said, "I don't think it was close to a call," but the dealer responded to the guy, "Well that's not my decision to make." The guy kept questioning it so the dealer called the floor over. I thought it was ridiculous. She didn't call. She just put a stack of chips barely in front of the rest of her chips and counted out a bet. She did not push them forward. There were still quite a bit away from the line on the table which may or may not be a betting line. You see people do that all the time. Although you see it more often in tournaments because people want to see how many chips they'll have left if they call and lose. It got weirder. The floor heard the dealer's story, perhaps the lady started to explain and the other guy started to explain and I was waiting for my turn and then, the floorman punted. I thought this was the guy who was running the room but it turns that was another guy. He said he would call the other guy over to make a decision. This was really getting out of hand. While we waited for the other guy to show up, I said to the dealer, "Doesn't my opinion count?" The dealer said, "Well, you said it was a call…" Ugh. He obviously hadn't been paying complete attention. I said, "No, this other guy—who was already out of the hand—said it was a call. I don't think it was a call. In fact, I know it wasn't a call." This was more forceful than the lady had been. She was being oddly quiet. I added, "I've been playing with her for hours, I know she didn't mean to call, and she definitely wasn't trying to pull an angle." The dealer said, "I thought you were saying it was a call. If you are agreeing that she folded, that's it." Just then the other floor showed up but the dealer said to him, "Never mind, it's ok." And pushed me the pot and mucked her cards and the issue was resolved. It was bizarre. Maybe the guy who was complaining really thought this was a similar situation to one he'd been in recently that was ruled differently. But I suspect he was more interested in seeing the hand play out so he could see what/how I was playing. Just a guess. I was perfectly fine with her fold. Knowing my luck with pocket Kings, if she had a draw, she would have hit it for sure. Ok, I'm just kidding there. But to me it was clearly not a call. Let me put it this way, it was not a call in any card room I've ever played in, including this one. So it was simply the right thing to do to let her fold when that was her intention. To rule otherwise would have been absurd. That resolved, she explained, "I had Queen-8." So I was right, she had a gut-shot. I surely wouldn't have been surprised if she had called. And of course, because I had pocket Kings the odds of a 10 hitting the turn were about 97%. You can look that up in any poker odds calculator. Just make sure you input that it is Rob with the KK. If she had only known me better, and known I had KK, she would have called instantly. I left not long after, booking a $140 win.